NASA’s activities in social networking media will be recognized Wednesday in New York, when the agency receives an award for its presence on the popular Web site Twitter. Known as the Shorty Award, it was created to honor the best producers of short content on Twitter during 2008. 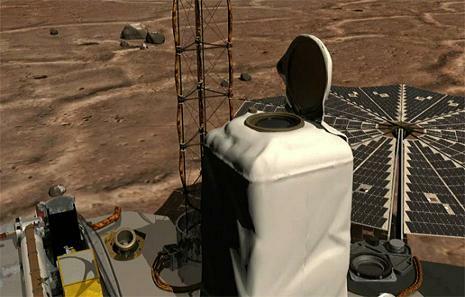 Updates on NASA’s Mars Phoenix Lander mission received the most votes in the science category from users of the site. The Mars Phoenix Twitter delivered more than 600 updates during the 152 days the lander was operating in the north polar region of Mars. By the end of the lander’s mission in early November, more than 38,000 people were following its reports, called “tweets.” The account is still used to provide updates on the mission’s science results and has more than 41,000 followers. “We created the account, known as Mars Phoenix, last May with the goal of providing the public with near real-time updates on the mission,” said Veronica McGregor, manager of the news office at NASA’s Jet Propulsion Laboratory in Pasadena, Calif., and originator of the updates. Twitter allows people to follow accounts of their choosing through the Web, or by having updates sent to their mobile phones. Users post short updates that are limited to 140 characters or less. The Shorty Awards were created by Sawhorse Media in New York and are supported by a grant from the John S. and James L. Knight Foundation in Miami. NASA’s Phoenix Mars Lander ceased communications Nov. 2 after successfully returning unprecedented science data to Earth. Launched Aug. 4, 2007, Phoenix safely touched down on Mars on May 25, 2008, at a site farther north than where any previous spacecraft had landed. Phoenix’s soft landing on Mars was the first in 32 years. Phoenix sent more than 25,000 images back to Earth. Science instruments returned a treasure trove of data that continue to be analyzed. NASA’s Mars Phoenix Twitter site is at: http://twitter.com/marsphoenix . In addition to the Mars Phoenix site, NASA maintains another Twitter feed that includes updates on other agency programs at: http://twitter.com/nasa. For a list of NASA missions providing updates on Twitter, visit http://www.nasa.gov/collaborate . For more information on the Phoenix mission, visit: http://www.nasa.gov/phoenix . For more information about the Shorty Awards, and a complete listing of award winners, visit: http://shortyawards.com .